"It's definitely a circus, and we're the big animals that people come to see." 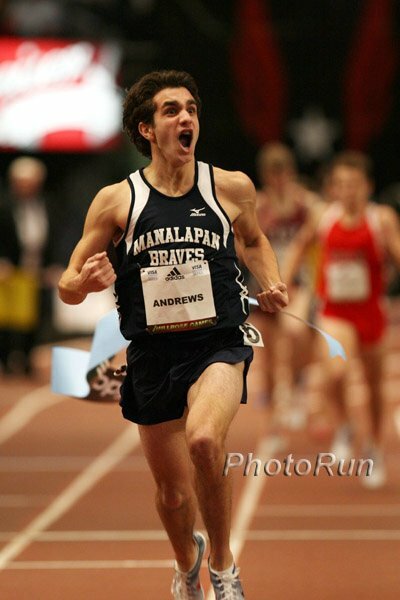 - Adam Nelson sums up perfectly what it's like to be at Millrose. I loved the Milrose games! 8:04 steepler VROEMEN declared innocent! *Binghamton's Eric van Ingen Runs His First Sub-4 With 3:59.58 Win At Penn State 2 other things caught our eye from this meet: #1) 3 Penn State guys ran 1:48 or better, including 2 ran 1:47, and 1 was true frosh Cas Loxsom from CT #2) Sam Bair, Jr. needs a few beers, as he AGAIN just missed cracking 4:00 at Penn State to join his dad in the sub-4 club (4 times he has run between 4:00.14 and 4:00.87 on that track). *Top NCAA Lists After Busy Weekend - 6 Collegians Go Sub-4 ... and counting. That's a lot of NCAA guys cracking 4 in January. Heptathlon Star Jessica Ennis Might Soon Break The World Record Ennis tied Chaunte Howard at 1.94m in the high jump and beat Lolo Jones in the 60m hurdles. Heidi Dahl beat world medallist Lisa Dobriskey to take a nice win for the otherwise lackluster American team. Hall Backs Out While Wanjiru Signs Up For Mardi Gras Half Marathon Disappointed after his Phoenix 64-minute half, Ryan Hall told New Orleans he's out. But along comes the half marathon world record holder Sammy Wanjiru, who is returning from a back injury sustained in Chicago. London Marathon Being Investigated For Its Relationship From Charities Our previous headline on this was wrong. There is nothing about any of this being illegal. The Marathon, a charity, raises some of its money by charging other charities fees for guaranteed entries into the race. The charities then raise money from runners in the race. USADA Bans Garfield Ellenwood 2 Years For Non-Analytical Positive Ellenwood's quick file is interesting: was fired in 2009 from coaching Bethune-Cookman, coached the Liberian Olympic track team in 2008, was a low level elite sprinter who testified in the Balco case against Trevor Graham, and coached an NCAA champion, Ronnie Ash, in 2009. *Olympic Champ Asbel Kiprop Added To The Mile Field A GREAT addition. Olympic champ is probably Lagat's best-ever competition. He was planning on making his indoor opener an 800 next month but when Mekkonnen couldn't get a visa, he was called in. Kiprop: "I feel good about tomorrow." *Bernard Lagat Goes For Record In Perhaps Final Wanamaker Mile The thing to note for fans is that Lagat, who's getting well into his 30s, is thinking this will be one of his last big mile races before focusing on the 5,000m. *Arrest #2 We actually expressed some sympathy for him after this one.